Guaranteed Forever. If your Husky product ever fails, bring it back and we will replace it free. This full warranty gives you specific rights, and you may also have other rights, which vary from province to province. For details, visit your nearby store or call 1-888-HD-HUSKY. Guaranteed Forever Warranty is for Storage Cabinet only and excludes Wood Top. Wood Top has a 1 Year Limited Warranty. 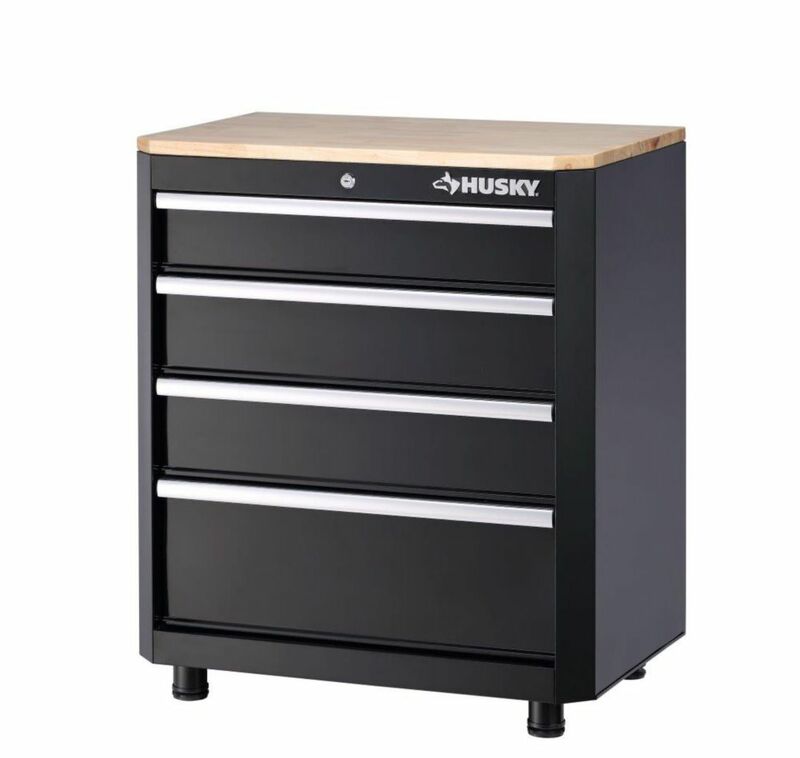 28-inch 4-Drawer Base Garage/Workshop Cabinet in Black Perfect for a garage, basement or workshop, this Husky 4-Drawer Base Cabinet is the ideal tool storage and protection solution. It is also ideal as a freestanding solution or docked under a Husky Workbench. Four drawers of varying sizes can accommodate a wide range of items and simplify organization. Each drawer rides on auto-return ball bearing slides for smooth operation and can withstand evenly distributed weight up to 50 lbs. each. 28-inch 4-Drawer Base Garage/Workshop Cabinet in Black is rated 4.7 out of 5 by 7. Rated 5 out of 5 by Richard from Solid piece, well designed I have had this for a month or so and it works perfectly. Good storage volume and well working drawer system. Smooth and nicely finished. Rated 5 out of 5 by pastel100 from Comes assembled and looks fantastic We added this to our laundry room for tools, etc and it looks fantastic with our dark grey washer / dryer. All I had to do was add and level the legs, the bench came with allen keys and screw driver bit and one extra screw. Very pleased and delivery was free! Rated 5 out of 5 by RayVars from Husky Cabinet The unit arrived as scheduled. Installation was simple. The cabinet functions great. The drawers slide beautifully. We are very pleased with our purchase. Rated 5 out of 5 by Betty Boop from Great Product I originally order another product and received a call from customer service telling me the product was no longer available. The customer service person was very helpful with helping me pick out this product. I love the cabinets and the look great. There durable and the wood top looks wonderful. Rated 5 out of 5 by Fatma from Best buy I bought my first drawer cabinet few months ago to organize so many items scattered everywhere and kept in small boxes in the garage, I can't express my happiness with the drawers when I saw everything well organized and so easy to find whenever I need them, I bought another one to keep my stationary and papers, if you think about installation you can find nothing easier! if you want something sturdy with smooth drawers and shiny beautiful surface you have to run to this marvellous product! thank you Husky, thank you Homedepot. No dimensions are provided. Not at all helpful when trying to make a purchase. What are they? Scroll down further past the &quot;upsell&quot; spam and you'll find specifications - including assembled dimesions.